a. Anti-inflammatory & Analgesic - By reducing pain, swelling and stiffness of the ligament. TenDlite boosts the metabolic rate at the site of your injury, giving it more energy to facilitate the lymphatic drainage it needs to heal faster. It regulates serious or chronic inflammation, encouraging tissue healing and reducing edema and bruising. b. Restoration, regeneration, and rebuilding - By restoring and regenerating the ligament at the cellular level. Since ligaments are made of fibroblast cells, which are made 86% collagen, TenDlite's encouragement of the fibroblasts to produce new collagen is a key component for the complete recovery of your plantar fasciitis. 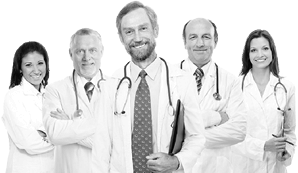 Fast collagen reproduction is the key to the treatment; it re-establishes flexibility, elasticity and strength of the ligament, which is normally slower to heal than other structures of the body. 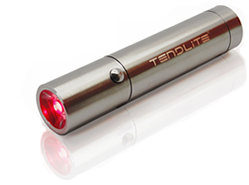 TenDlite speeds up this process up to 60%. Healing takes time, but by following the complete 5 Steps Plantar Fasciitis Treatment, your pain will be consistently reduced after 3 weeks instead of the 6 weeks it typically takes for the tendon to recover. In some severe cases, plantar fasciitis injuries can take up to a year. But the good news is: Plantar Fasciitis can be Cured! This is a drug free Plantar Fasciitis treatment. Our steps have helped many Plantar Fasciitis sufferers find a cure and avoid surgery. First aid is the first crucial step in taking care of an injury, and your foot needs this care as soon as possible after it begins. First aid for your joint consists of Rest, Ice, Compression, and Elevation. Stop the activity that was causing the pain and rest for 3 weeks. That might mean stopping all sports activities, pausing work, or simply letting yourself take a real break! Rest is extremely important if you want success in your plantar fasciitis treatment; as an injury caused by overuse and strain on your feet, too much movement is what is causing your pain. Failing to rest well can put you at risk for improper healing, and as a result, further injury, as well as chronic case of plantar fasciitis. Use cold therapy for 2 days. Ice is a natural inflammatory and a natural anesthetic — it will help take the swelling and pain down. A cold pack is ideal under the bottom of your foot. The first 2 days are the most important time for ice, so for the first 48 hours, apply it in sessions of 20-30 minutes, three times a day. Compression might sound painful against an injury, but in fact, it is used to lessen the inflammation created by the inflammatory process. By wrapping an elastic bandage — rather than a plastic one, which can compromise blood flow by getting too tight — around your foot, you'll be helping your ligament heal. It should be snug, but with room to breathe and contract your muscles underneath. You still want to be able to move your toes somewhat and maintain proper blood flow. Elevating your affected foot will greatly reduce swelling by increasing the return of healthy blood to the circulatory system. Besides the decrease in edema (swelling), the restored circulation will even help by getting rid of unnecessary waste from the area. The idea is to raise it above the level of the heart — while still being comfortable! Pillowing your knee, leg and ankle to raise your foot while at rest (Step 1 — still important!) is an easy way to elevate it. An additional way to keep your ligament, muscles and joints healthy is to combat the plantar fasciitis from within with supplements. Omega-3 is an essential unsaturated fatty acid that can't be made by the body. Taking Omega-3 supplements decreases the output of inflammatory markers from fat tissue, which simply means that your inflammation will be reduced. Brace your foot using a suitable brace (these can be found at most pharmacies). This will ease the strain on the affected ligament and joints and help to prevent provoking pain. The stabilizing brace is also a protective measure against further damage. Just like the compression, make sure the brace fits well but is not too tight. Rehabilitation – Rehabilitation is an important step to ensure the health of your foot's ligament and to keep it accustomed to movement. You want to slowly begin to encourage the joints associated with the ligament to move normally. Start by using a light resistance. The movements should be slow and controlled, followed by stretching by gently extending the toes, ankle, and calf. Keep up this daily rehab routine for 3 weeks. 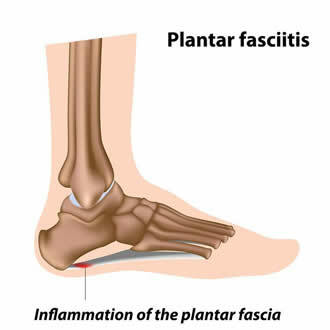 Evaluation –By this step, you should have an idea of how your plantar fasciitis is doing. Do you still have pain? If you still feel pain after 3 weeks of following the prior steps, don't push yourself onward. As you recall, working through the pain only works against you. Keep on with the rest and care: repeat steps 1-5 for another 3 weeks and see how you feel then.If your foot does feel better and stronger, you can proceed with further rehabilitation while using TenDlite daily. It's time to return to your activity! By now, you'll be ready to return to your regular activities — your foot is strong enough to take that step. The areas most important to exercise and stretch with plantar fasciitis are the toes, the foot itself, ankle, and calf (where your Achilles tendon is). Always warm up your foot (or feet) before exercising, however! Stop each movement before the point of pain. Follow by stretching your foot out, especially the ligament, and do 1-2 minutes of TenDlite therapy afterward in order to ensure that the ligament is getting enough stimulation toward the production of collagen and complete recovery of elasticity. It also helps to prevent the formation of poor scar tissue. After this therapy, it's important to avoid injury; scar tissue can cause chronic plantar fasciitis.If your pain persists after this plantar fasciitis treatment, you need to visit your doctor for additional analysis of your condition. If your pain persists after this plantar fasciitis treatment, please visit your doctor for further medical investigation.